A man A plan A canal » Record Store Day Is Saturday – Tell Your Listeners! This coming Saturday, April 13, is Record Store Day. The annual event has been a crucial part of the vinyl resurgence over the years, and it’s drawn attention not only to records themselves but to the local, unique stores that sell them and the communities that exist around those stores. 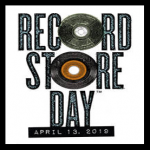 Make sure your listeners know which local stores are participating in this year’s Record Store Day – a full list can be found here – and check out this list of all the great, RSD-exclusive releases coming out on Saturday. We’re particularly excited about this reissue from the bird and the bee!